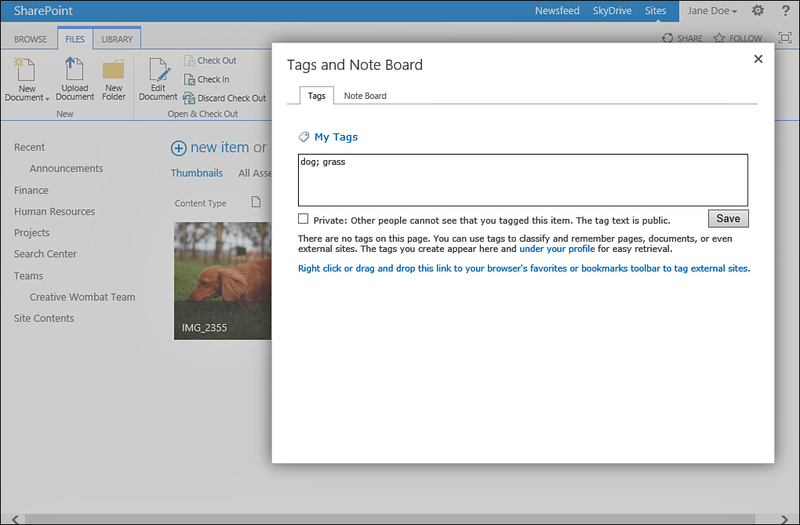 About Microsoft SharePoint 2013 : What Is Tagging? Tagging is a social web mechanism available in Microsoft SharePoint 2013 Server (not in SPF) that allows you as the user to tag a document or a list item or even a page—in the SharePoint site or outside it. This mechanism needs to be turned on by the server administrator, so you might or might not be able to use it. You can tag something to help remember it and find it more easily later on. For example, you can tag a page of a document library with the tags describing the common denominator for the images in that library as shown in Figure 1 for example. You can use whatever tag keywords you want, and you can later remove or rename tags. FIGURE 1 The document library is tagged with two terms—dog and grass—to help users find it later on based on the terms. You can also add notes to an object, including saying what you like or dislike about it, or any other kind of notes. These notes are displayed to other people who look into the notes that you write, and you can view them as well. You can therefore keep working notes on documents or pages you are working on without those notes being part of the actual document or page. Available only through Microsoft SharePoint 2013 Server (not SPF), and in some plans of SharePoint in Office 365, managed metadata is a mechanism that allows administrators to create hierarchical term sets that can then be used in document libraries and lists as columns. A term set is similar to a list that contains items, except that these items can contain more items under them in a hierarchy. For example, if you have a term set called Products, you could have a term for each product that you have in the organization. By using managed metadata, you can create the list as a hierarchical list, grouping the products into categories (creating terms for the categories and then terms for the products under them) or into product groups, as shown in Figure 2. FIGURE 2 A managed metadata list of products. You can then choose whether the terms that are categories (and not products) are available to the users as options. You can therefore allow the users to tag a document as belonging to a category of products (for example, Books), or you can let them tag a document as belonging to a specific product. 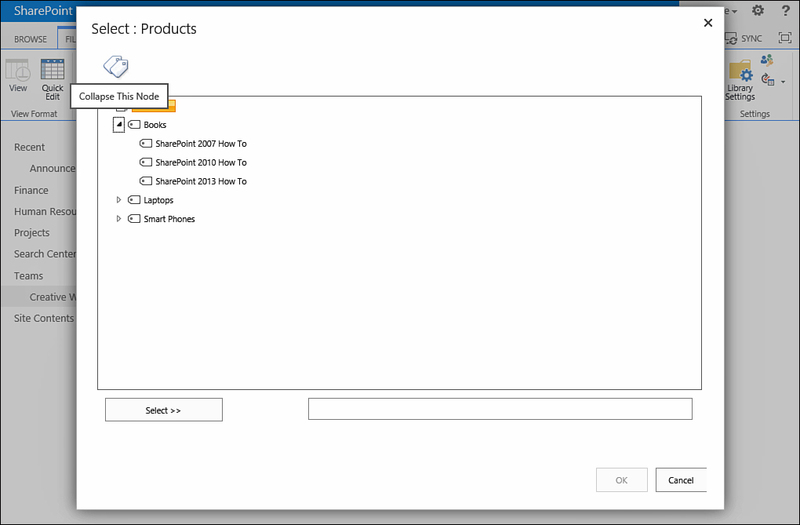 Managed metadata in SharePoint 2013 can also be used to manage the navigation of a publishing site, where the navigation bar shows links from a certain term set. This can prove useful if you want different sites to share the same navigation, while managing it from a central location. - About Microsoft SharePoint 2013 : What Is a Document Library?